FXC Intelligence Founder and CEO Daniel Webber sat down with Michael Kent, Co-Founder and CEO of Azimo. Below are some of the highlights of the discussion DW: What is Azimo looking at in the next five years? Michael: If you think back to being a small child and grabbing your parents hand and walking down High Street in all likelihood you probably walked past a bookseller, you probably walked past a travel agent, and those businesses just don’t exist on High Street anymore. I think it’s pretty common knowledge that financial services is lagging behind the rest of industry in terms of adoption of digital services, but in five years time, there’s not going to be any Western Union, there’s not going to be any Moneygram outlets. Everyone is going to be sending money digitally. And our expectation and our vision for that is as one of the providers that people choose to use. DW: What about cash out problems in difficult places? How will you solve for that? Michael: We offer 250,000 cash-out points all over the world. And they are very important in some parts of the world, and very unimportant in others. For example, a case that is close to my heart is Sierra Leonne, one of the poorest countries in the world and an ex-British colony. We have, cash-out points throughout Sierra Leonne. In the Philippines, we have about 10,000 cash out locations. And we get those locations by partnering with local financial institutions in those markets. So to answer your question, we build that network. But we also have is, we have a digital wallet network so we can pay into digital wallets, things like M Pesa, things like MTM wallets, which is slowly getting traction, it’s early days for that kind of technology. We offer home delivery in certain markets, we offer local payments into bank accounts, and then we offer very large hard currency payments using cross money banking or SWIFT. We do a pretty broad range of settlement options, because of course, sending money is a distressed purchase, it’s not something you do because you want to. You don’t derive any satisfaction from sending money overseas, you do it to do something. DW: What would you say is the key international market for Azimo? Michael: So we have less of a specific focus as some of the other guys, particularly guys in the US. In the US, it’s all about some very big, obvious markets – Mexico, India, the Philippines. We do have key markets for us – Poland, the Philippines, China, West Africa – Nigeria, Ghana, Senegal, Cote d’Ivoire, particularly from France, South Africa, and none of those markets are more than 10% of our flow, so our market – portfolio like – is spread throughout a lot of different markets out there. DW: Can you share some insight on where you’re going? New send from places, as well as the receiving end. Michael: So in terms of send, the corridors that are growing fastest are from Europe. Germany, France, Spain, the Netherlands, Austria, big markets for us. DW: How do you think about expansion? Michael: So we really think about solving problems. We think about service, and are we are able to parter with someone who provides a great service, which means fast, commercially attractive for us and for the customer versus what’s in the incumbent market. Germany, for example, is one of the most expensive markets in the world, over ten percent to send a 200 dollar money transfer – Germany is a market where we can do a lot of stuff. So we look at, can we solve a problem with one of our partners, is there a big enough market there to go after? Some of these places are incredibly niche. We put it out there and see if people want to use it. So what we see, in terms of development is, we have a great service, people start using it, the cost of activation, which is something we track quite closely, tends to start out high, and it scales down very fast. Because, actually, the largest single channel that our customers come in from is the word of mouth, or referral. So it’s not, in that sense it’s a great business, because we aren’t telling people to use it, we are getting other customers to tell people to use it. I’m also overly surprised just how sticky customers are. Customers know that the money is available rapidly and at a good price – so they stick around. DW: How do you differentiate from some of your friends and non-friends in the space? Michael: Honestly, you can’t charge ten percent for money transfer in a super competitive market. So to your first question, sending money to dollars euro pounds, for large money transactions is super competitive. There’s not a finance director that hasn’t been approached fifty times by an FX broker offering him a remarkably better price. I’m not looking after those guys. I am looking for the guy who would go to three or four networks on a high street, and wants to send money that way. There’s not that many people doing it. 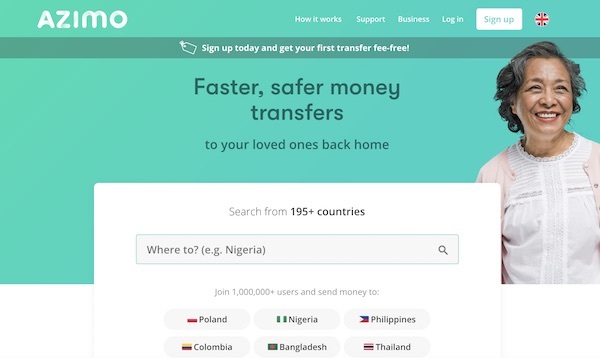 If you want to send cash to the Philippines, who are your options? Western Union, Moneygram – we take many of our customers from the in-person money transfer world. I have a lot of respect for Remitly, WorldRemit, I think they are doing great jobs- both of them started early enough and they have their own focuses. WorldRemit on English speaking markets, Remitly focused on corridors involving the US. But you know it’s a 600 billion dollar market, and I think attention is the start of press. But they are very focused. The market breaks down to a lot of different areas. We are not FX brokers. The thing about FX brokers is, to send dollars to America – Transferwise’s branding is stuff your bank – our branding is, stuff Western Union, stuff Moneygram – we are going after different markets. We have extreme confidence that we are well priced, fast and convenient. You don’t have a warm affinity for whatsapp, you just know it works and think it’s safe. DW: Talk to us about the corporate product you have launched? Michael: Corporate is the wrong word, small business is better. This was response to customer demand. We had more and more small business customers trying to use our stack. Existing customers who wanted to use it for their business transactions, as they told us and then people coming on wanting to register as an individual for a business transaction, which we automatically block because it doesn’t meet our compliance standards. They are micro and small businesses, we are not about to start doing this for the people that Moneycorp, Transferwise and Travelex service. They’re not really different from our consumers, the compliance standards are slightly different and the amounts sent are slightly different, but otherwise it’s very similar. If customers want to use it that way and we can’t respond it feels like a miss. We haven’t picked what markets specifically to go corporate in, it will be available where we operate. Again, most of our corporate customers won’t be sending dollars to America, they’ll be sending Brazilian Rials to pay for imports. A lot of our customers sell stuff on Etsy and some other marketplace businesses, so they are importing stuff from there. One of our biggest customers imports Bayabas (guava) it’s a fruit that gets ground up and is considered a health food. Our customers who import bayabas send money all over West Africa to import this. They couldn’t do that with Barclays, but they can do that with us. DW: Are you thinking about a marketplace type solution such as what Payoneer, World First and OFX offer? Michael: I don’t know enough about it. Ant extension of the product line is always taking you away from your core focus. We think there’s a monster market in Europe that we can tackle before we start building out a bunch of functionality for people. I think actually, it helps, to have a global network, because you’ve got US and Europe, but you know, never say never. DW: Talking Technology. I assume mobile is your key focused? Michael: Yes, the vast majority of our customers make transfers on mobile platforms. Apart from the Germans, the Germans still love the desktop. DW: So how do you get the German user to switch from desktop to mobile, assuming that mobile is a better home for your customers Michael: If you look, there’s always a group of people who just don’t like installing apps. They don’t like the way it slows down their handsets, and we don’t think it does, but they don’t like the app experience. And so, I suppose, we ask them nicely. We try to incentivize them, I think you get a free transaction when you move to the mobile stack. The idea is, once you’ve downloaded and had that experience, you should want to come back. DW: What’s are the most interesting things you can share about this sector? Michael: From my perspective, there are three really interesting things that have happened in the world of money transfer in the last five years. The first is with Paypal bought Xoom, that kind of deal rationale. That the next billion customers aren’t going to be in Europe or America, they are going to be elsewhere and actually Xoom is the first step in being able to talk to those customers. I think for us, for me, that was a legitimization of a sector in a digital form that had always been kind of a bit of grubby from the perspective of financial institutional investors and the rest of the financial services sector. I think the second massive thing that’s happening, is apps. Third are some of the new entrants. Jack Ma wants alibaba to be one of the top ten economies in the next twenty-five years. The scale of vision is incredible compared to the size of a traditional money transfer business. When you consider the landscape five years ago, it’s mind blowing that this much change can happen.